A picture that paints a thousand words, mostly four-letter ones. 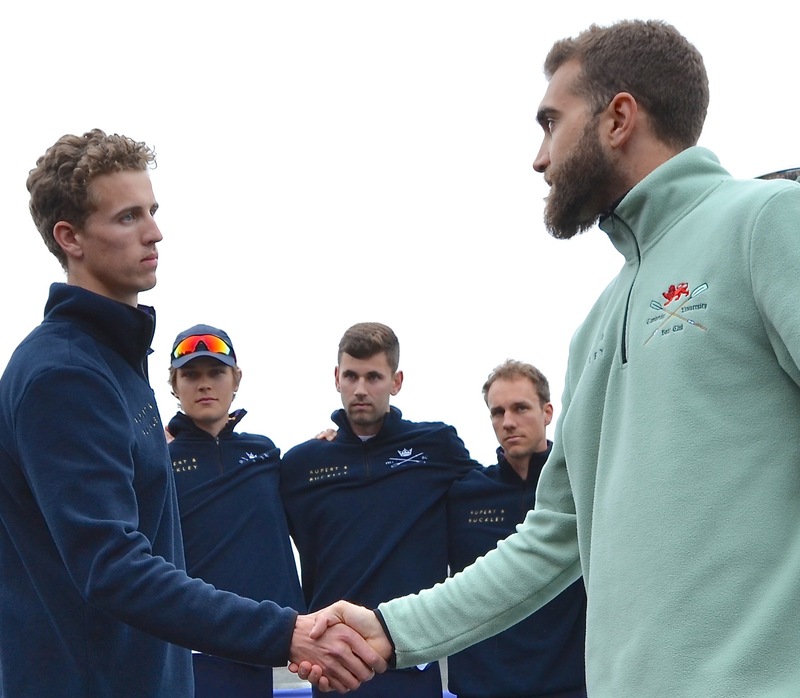 Oxford President Felix Drinkall (left) and Cambridge President Dara Alizadeh (right) shake hands and exchange stares after the flipping of the Race’s 1829 gold sovereign to decide stations. Tim Koch is back from Mortlake. 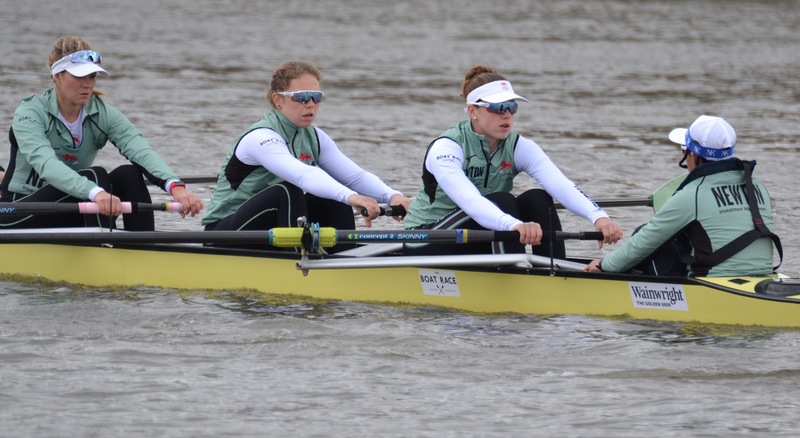 As befits a website more concerned with the past than the present, Hear The Boat Sing does not usually produce an immediate report on the Boat Race Day races. HTBS Types are most likely to have watched the race live on TV or in person, or saw it soon after on ‘catch up’ and have worked out who won without our help. For those who missed it, here is a rather crass summary of the culmination of nine months’ work. Cambridge won the women’s race by 5 lengths in 18 minutes, 47 seconds. 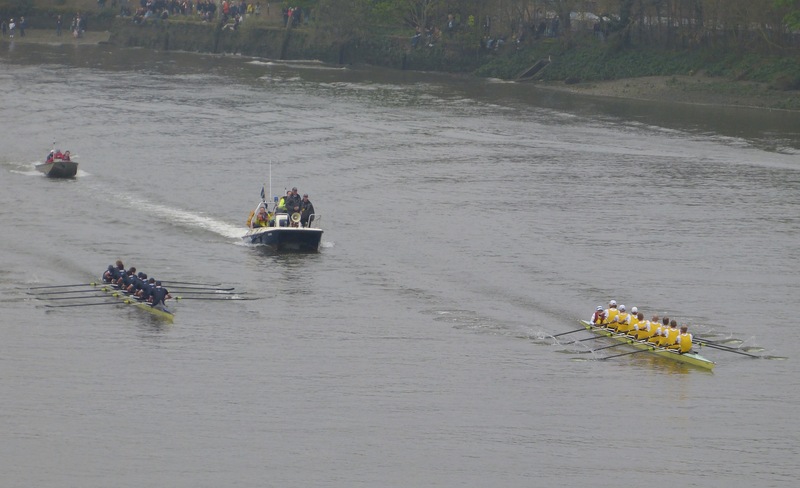 As BBC commentator and former Oxford Blue Zoe De Toledo pointed out, Cambridge were not for slowing down as the race neared a conclusion that had been inevitable for some time. Setting a fearsome rhythm, Light Blue stroke Lily Lindsay drove the rate up as the home straight unwound and Oxford, still digging deep, followed in their wake. Finish 18.47; 19.04 (Record 18.33 by Cambridge in 2017). Score since women’s race came to the Tideway: Cambridge 3, Oxford 2. Cambridge won the men’s race by 1 length, 16 minutes, 57 seconds. 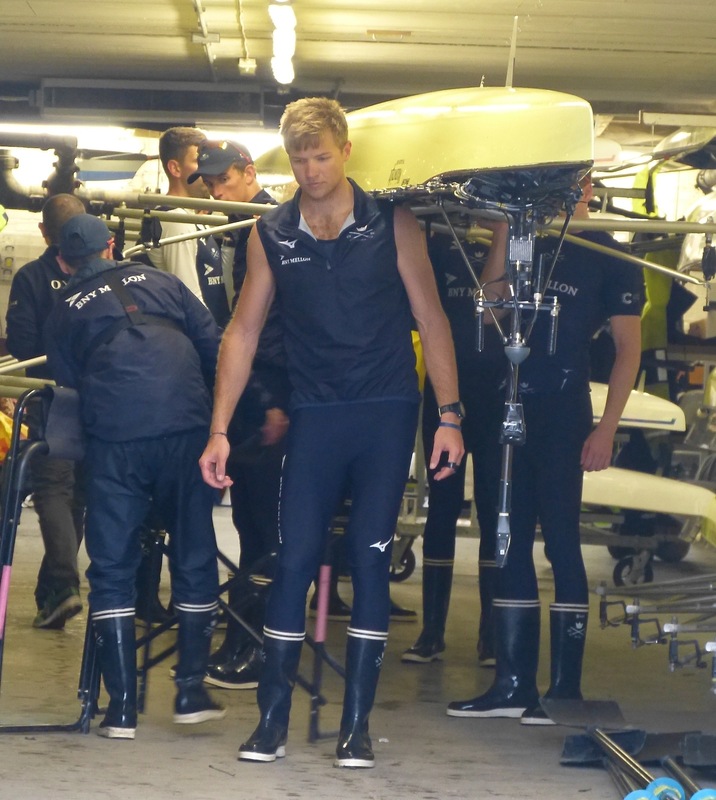 What was fantastic to witness was the constantly shifting power dynamic in the contest – Oxford once again appeared to be clawing back inches on their opponents as cox Toby de Mendonca roared his boat on. 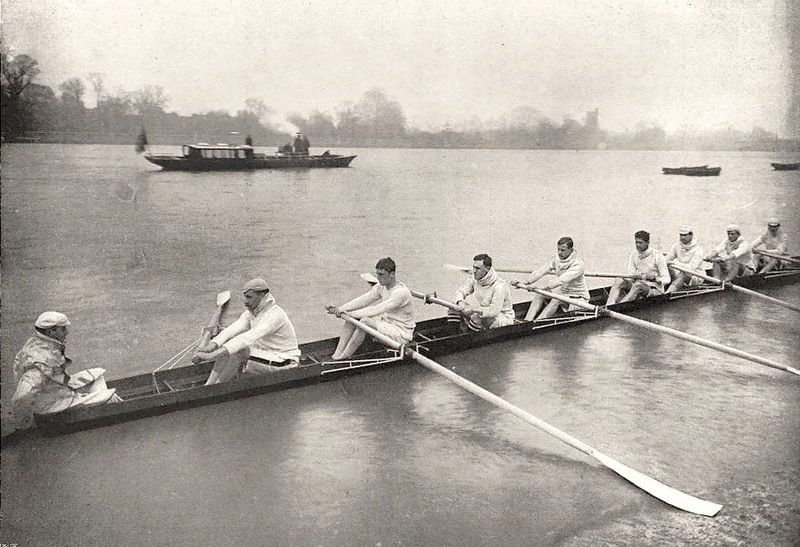 But despite this, and despite the spirited efforts of a young Oxford outfit, Cambridge held on to win in 16:57, powered by the traction of their engine room, the rhythm of the stern pair and the sheer bloody-mindedness of Dave Bell and two-times Olympic gold medalist James Cracknell in the bow seats. Finish 16.57; 16.59 (Record 16.19 by Cambridge in 1998). Score: Cambridge 84, Oxford 80 (one dead heat). 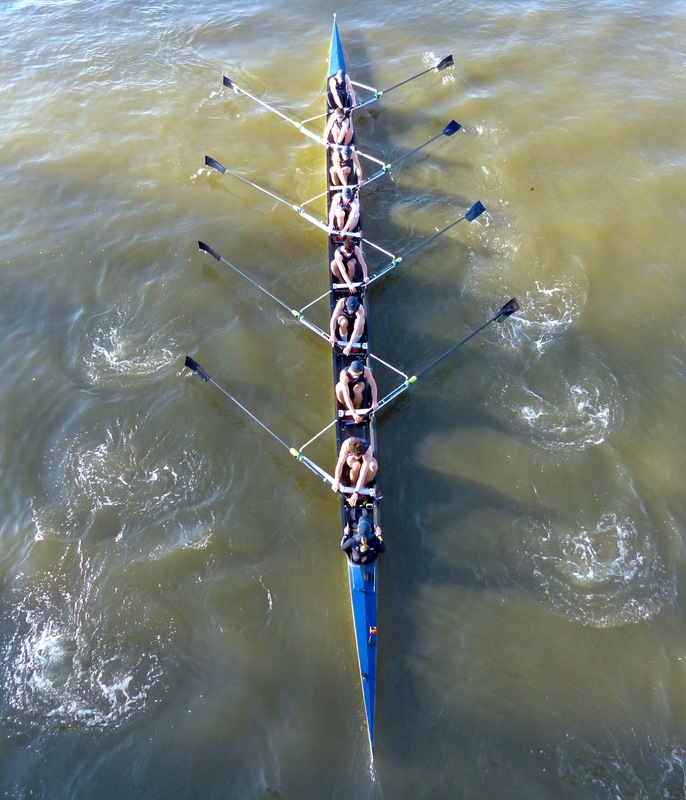 In the reserves races, Goldie, the Cambridge Men’s Reserve Crew, beat their Oxford counterparts, Isis by 1 length, time 17min 17secs (shown here). 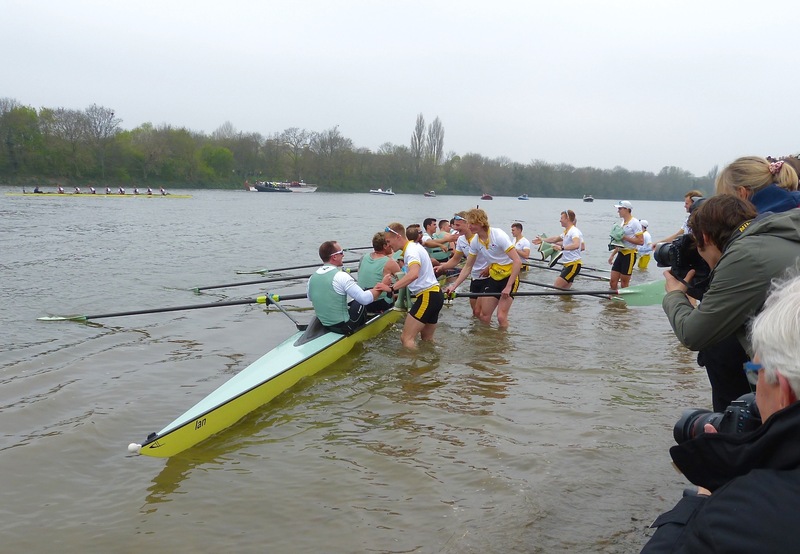 In the women’s race, Cambridge’s Blondie beat Oxford’s Osiris by 5 lengths, time 19min 19secs. This year, there was much more mainstream press coverage than usual but, unfortunately, it was mostly about the Cambridge ‘2’ man, the number of birthdays that he has had, and recent developments in his personal life. In days past, Oxford’s late crew changes (Charlie Buchanan replaced Benedict Aldous and Toby de Mendonca, replaced cox, Anna Carbery) would have been widely covered by the papers but today, unless someone has a ‘human interest’ back story, few seem interested. Although 72 competitors took part in Boat Race Day 2019, most of the press and photographers were obsessed with only one of them. 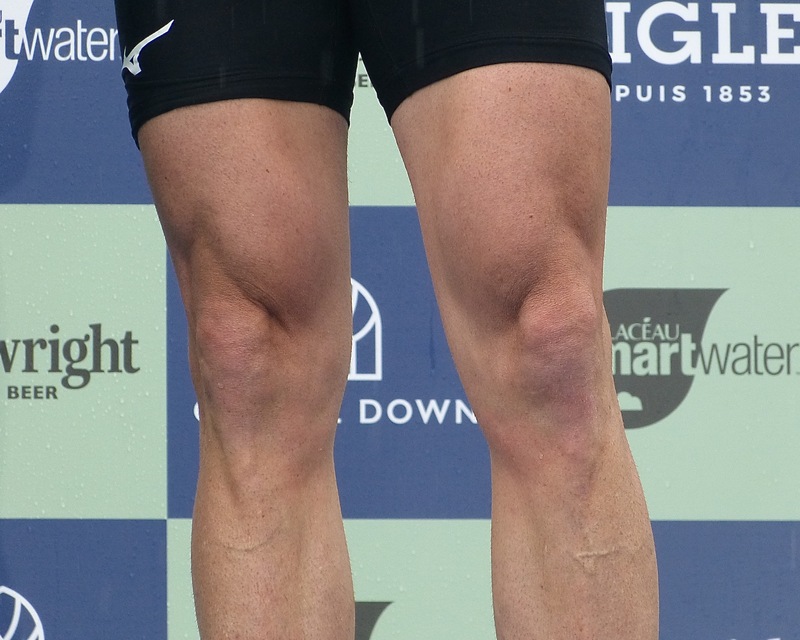 To balance out all the pictures of his rugged good looks, here is a shot of his 46-year-old knees (which, it must be admitted, did some remarkable work). Recently finding fame for its Boat Race coverage, The Independent set the general tone with its headline ‘James Cracknell’s Cambridge beat Oxford’ (the owner of Oxford is not recorded). However, London’s Evening Standard perhaps surpassed this with a header that read ‘Cambridge with the help of James Cracknell win both men’s and women’s races’. It seems that the Tab’s ‘2’ man helped their women to win as well, quite an achievement. Giles Richards does a reasonable job in The Guardian, while half his report is devoted to Cracknell, the other half is actually concerned with rowing. Hard for the once-a-year rowing viewer to say with any certainty, but the BBC certainly did the sport proud on the day… There will be some for whom the whole event is just too anachronistic and closed-shop to ever be tolerable, but others will appreciate a really professional job being done on amateur sport. Also in the Telegraph, Jim White tried to write about the rowing, but could not stop himself coming back to the sprightly old guy in the Cambridge bow end. Still with the Telegraph, predictably the best coverage came from Rachel Quarrell. 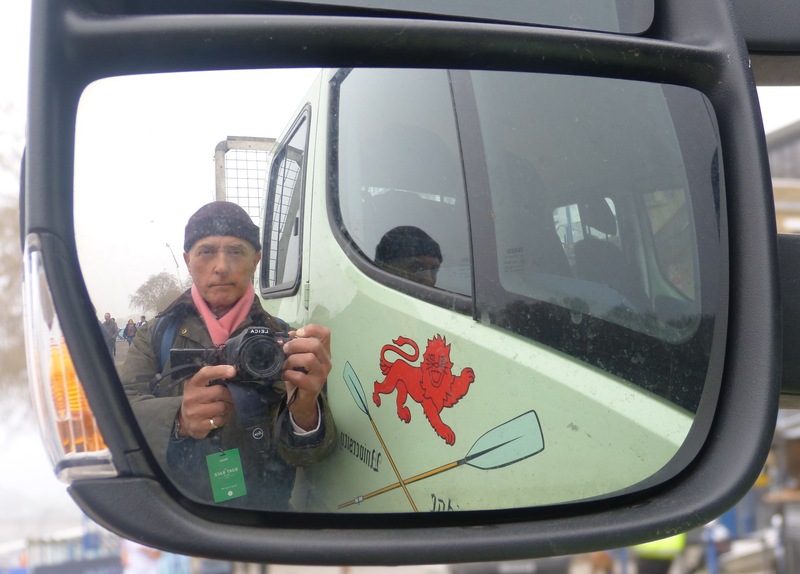 Her editors chose to publish her piece on this year’s less exciting race, that of the women, but click here to see how rowing journalism should be done. 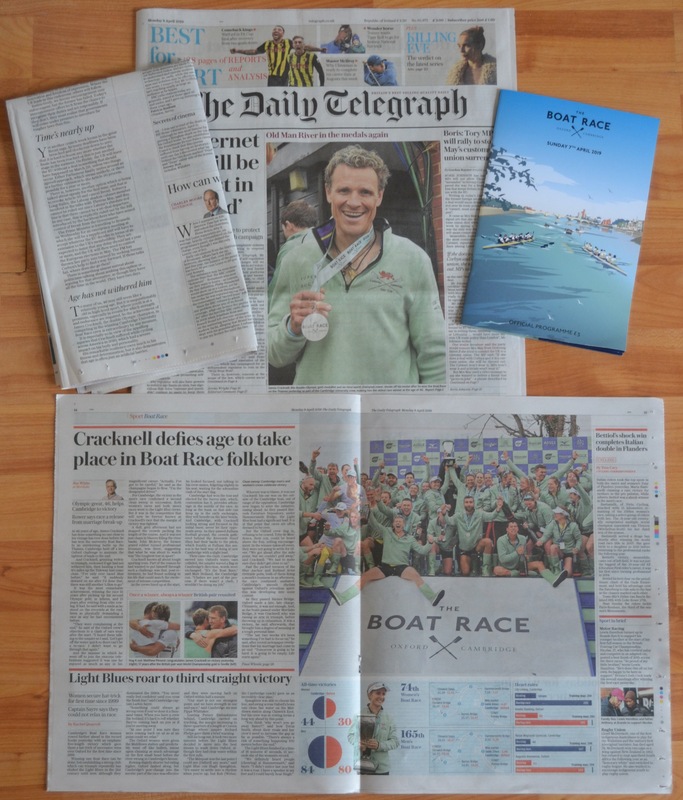 The “Daily Telegraph’s” Boat Race coverage on 8 April (plus the Boat Race programme). It may be a passing gimmick, but nowadays many newspapers are not only online, they also produce editions using ink and paper. For any young people reading, these are like the Internet but are made out of trees. Looking at the ‘real’ Daily Telegraph of 8 April, the broadsheet front page has a 9×7 inch picture of James Cracknell, the last item in the leader column has a few inches declaring that Cracknell proves that ‘age is often just an artificial barrier’, and the tabloid size sport supplement has a double page spread with the White and Quarrell pieces, four photographs and some graphics. 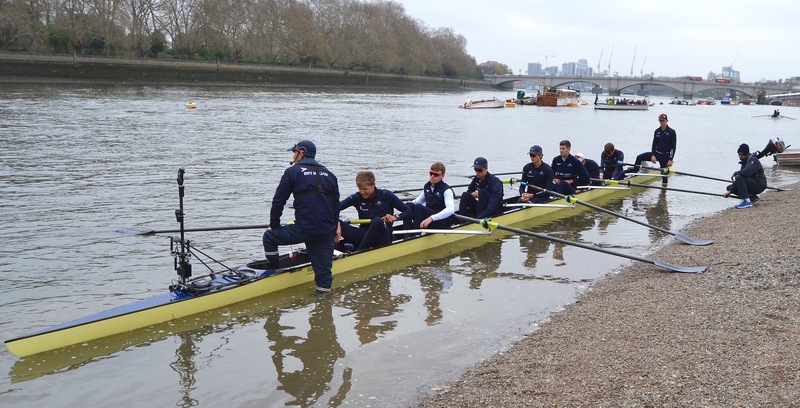 Those in the UK will be able to watch the BBC’s coverage of Boat Race Day on iPlayer for the next month. Click here for 160 minutes of fun. The programme (minus commentary) is also on YouTube. 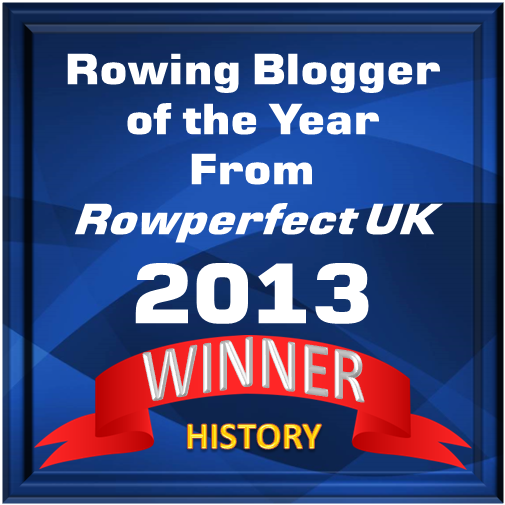 The HTBS Man On The Towpath, plus others, will be producing more Boat Race pieces this week. 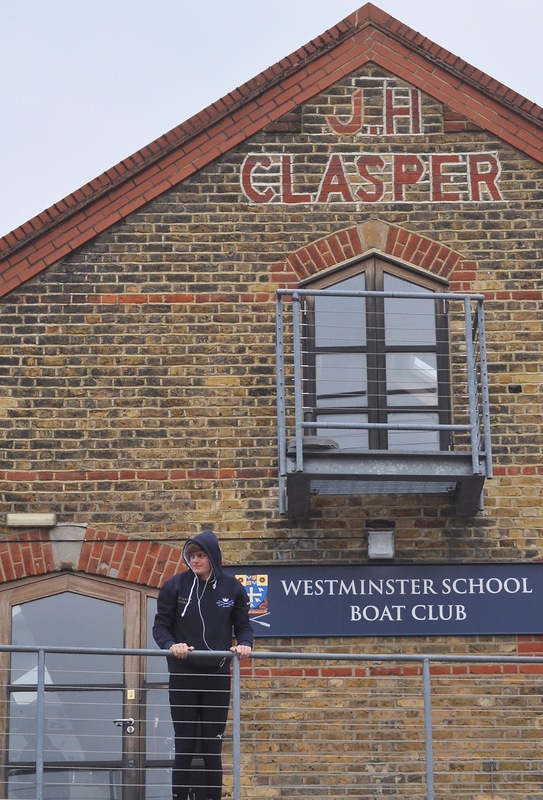 For now, here is our annual look at how the Boat Race always changes – but also stays the same. Cambridge cox and stern three, 2019. 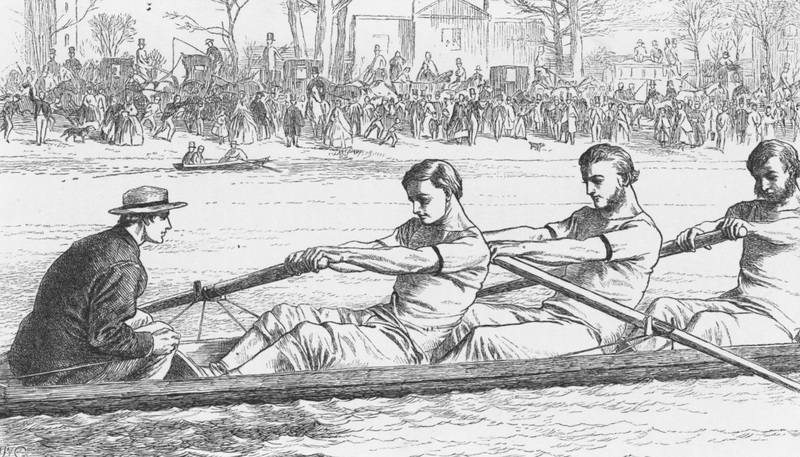 Oxford cox and stern three, 1870. Oxford boatman, Austin Dorey, 2019. 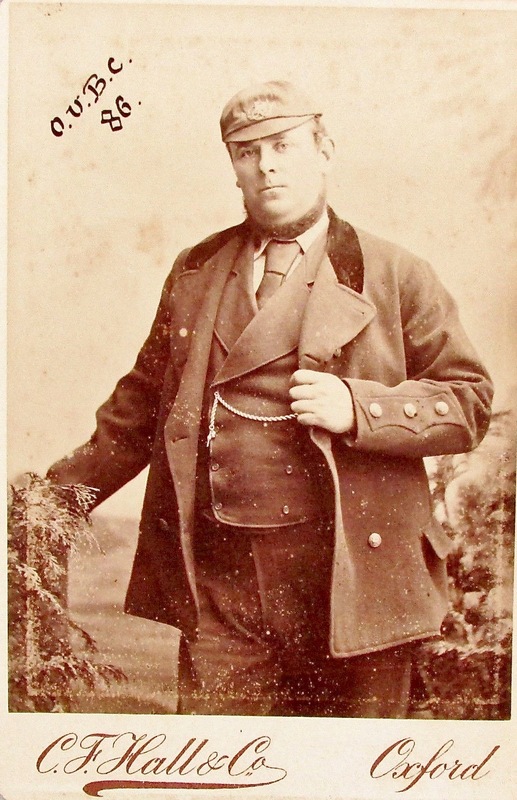 Oxford boatman, Tom Tims, 1886. Oxford in the boathouse, 2019. 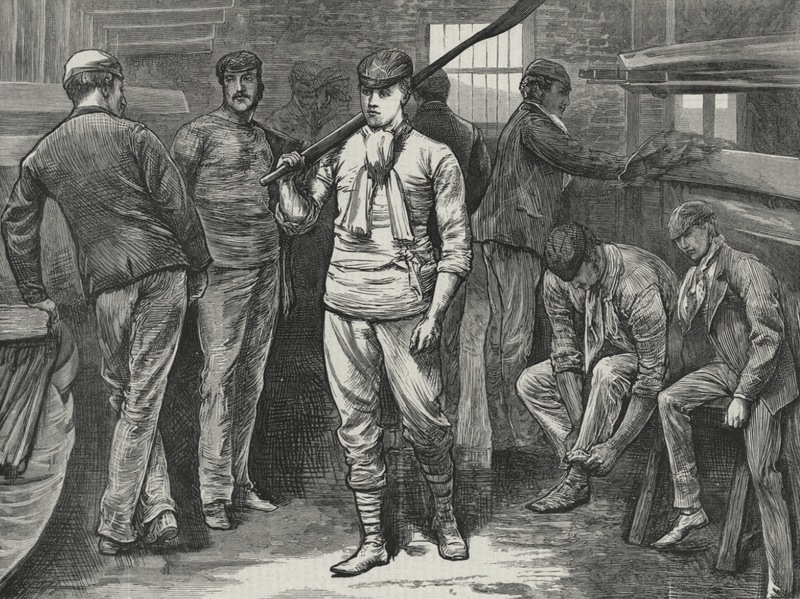 Oxford in the boathouse, 1872. Listening to music is a solitary experience for this Oxford man in 2019. 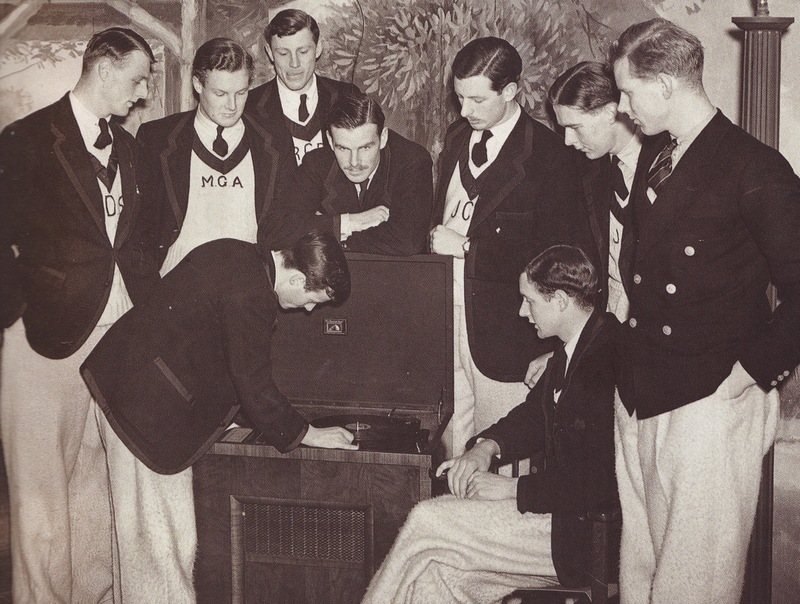 Listening to the latest banging sounds was a shared experience for the Oxford crew in 1937. Cambridge, victors at the finish, 2019. 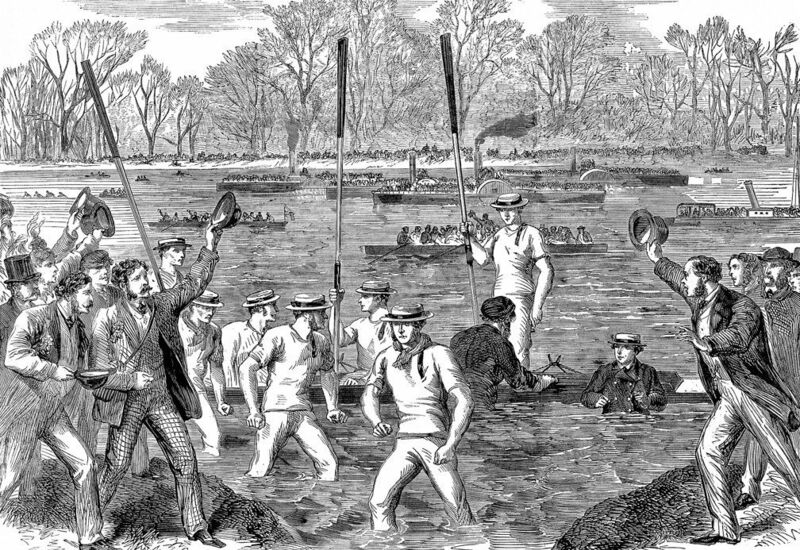 Oxford, victors at the finish, 1863. I am relieved that it’s not just me and my family, then, who were getting quite fed up with all the attention on Cracknell both on the day and in the papers afterwards. Anyone would think he was in his eighties, the way they went on about how old he was. We wanted to hear more from the other crew members. 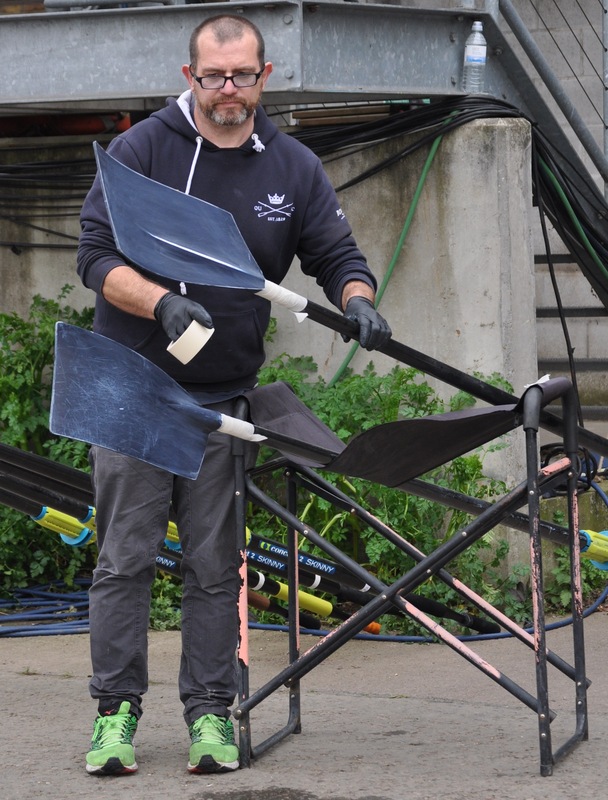 I watched it all on YouTube later in the day and it was delightful to go through it all without any commentary, just the coxes to listen to all the way along, including quite a lot of swearing which may not have been apparent during the BBC coverage. The real-time comments at the side of the screen are fun, coming from viewers who had watched it as a live feed, some of them amusingly ill informed. For the rowing enthusiast the Boat Race is always one of mixed emotions. Elation that our sport gains such world wide publicity and frustration that that same publicity invariably trivialises the sport we love. The ‘Cracknell Angle’ is a case in point. 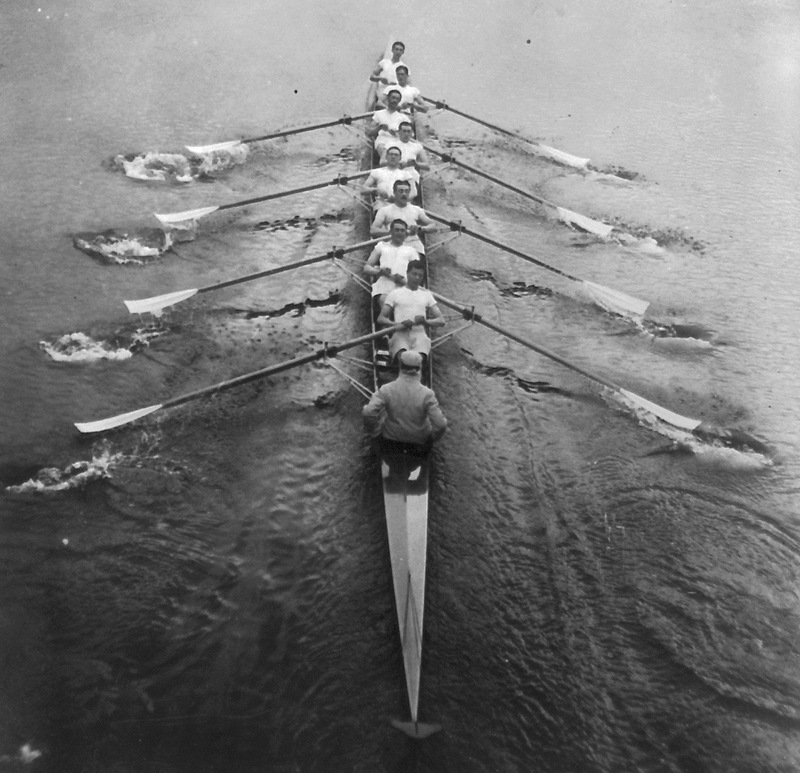 The media’s undue concentration on one member of the crew, belittles the efforts of the other eight whilst , at the same time, completely disregarding the Oxford coxswain’s appeal for interference and the Umpire’s ruling regarding same.